As one of the most respected female choreographers in the world, Rosie Kay doesn't shy away from controversial topics - instead she embraces them before transforming them into emotive, unforgettable dance routines. Moving on from her acclaimed work about refugees and asylum seekers in Asylum and as the choreographer for popular movie Sunshine on Leith, about soldiers returning from Afghanistan to normal life in Edinburgh, Rosie now addresses the effect of war on the mind and body. 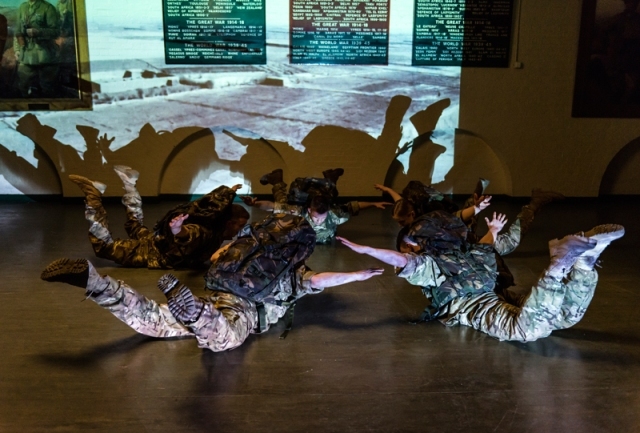 Her latest modern dance venture is 5 Soldiers: The Body Is The Frontline, which opens at Birmingham Repertory Theatre on April 23 and tours the UK until June 13. 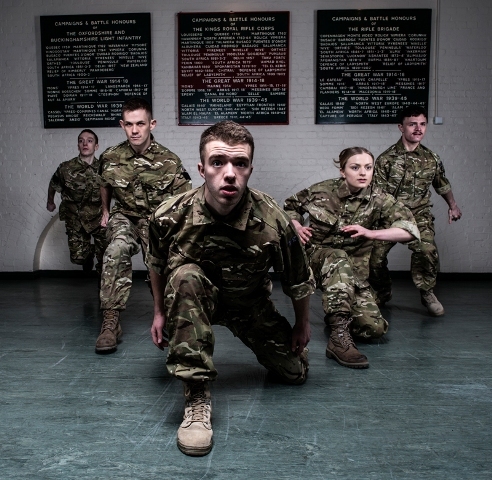 Alongside theatres, it will also be performed at military drill halls and Officers' Clubs. There are also plans afoot to tour the production in America in 2016. Portraying the impact and lasting injuries that war and conflict have on five soldiers through dance, the artistic director worked closely with the military on the project and revealed it was one of the most physically demanding experiences in her life. That's because it involved Kay joining the Army for full battle exercises in the remote wilds of Dartmoor and Salisbury Plain. Kay says: "I went through the process of joining the 4th Battalion The Rifles infantry for two weeks, which was exhausting, and also spent time with injured soldiers at rehabilitation units in Headley Court, Surrey, and in Selly Oak, Birmingham. "I wrote in my diary a lot of detail on everything, like feeling scared on the exercises and everyone having to take their shoes off so their feet could be examined. I was running across Dartmoor and as it was so boggy, I was falling over, getting up and falling over again while there was firing going on over my head. "From my diary, I pulled out what felt dramatic and the important movement ideas. I ended up with lists and lists to work with and that's when I took it into the studio with the dancers. So, for instance, elements of falling over and getting back up feature in the show." "I did feel the pressure of getting it right as from early on, I realised how precise soldiers are with their work and if you get something wrong, that's what they keep talking about. They'd talk about movies that got army life completely wrong or the ones that got it right." 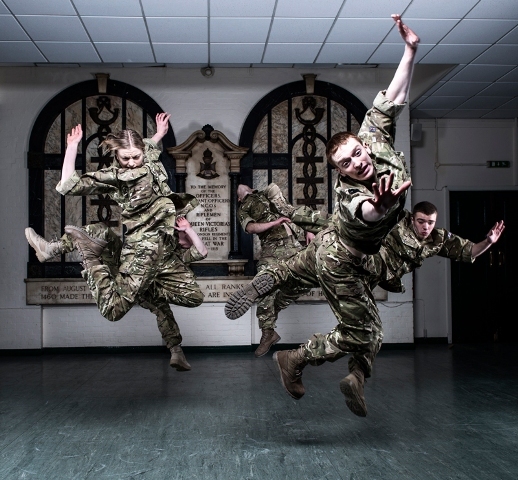 Performing 5 Soldiers is Birmingham-based Rosie Kay Dance Company, Kay's international award-winning dance theatre group. It features the choreographer's trademark style of intense physical and athletic dance. It's also an intimate view of training that prepares troops for the sheer physicality of combat, the possibility of injury, and the impact of conflict. "I felt I needed to get under the skin of these soldiers, to feel what they feel," Kay tells me. "It was important to me that the dancers also spent time with the military and talked with soldiers to understood them and make the performance richer." Becoming the first choreographer appointed as Artist in Residence at the University of Oxford's School of Anthropology and Museum Ethnography in 2013, Kay has been a tour de force in the dancing world, described as a choreographer who creates intelligent and meaningful dance. That seems to very true for this latest project. Passionately describing her reasons for tackling the issue of war in the current climate, she explains that it was partly due to her anger at the "big disconnect" between the public and the military despite 13 years of conflict in Iraq and Afghanistan. "We weren't invaded so we don't feel it on a day to day basis," adds Kay, "but from spending time with the Army, I was struck by the level of injury. There has been a lot in the news about World War One remembrance but we are in danger of forgetting the legacy of these wars - we still don't totally understand post traumatic stress. There are issues right now and the military is trying to modernise and come to terms with itself to become an Army for the future. Since becoming a mother recently, the choreographer admits that her perceptions have shifted slightly when she considers her own child. "I always felt harrowed that there were young men going out to war and getting killed, but now I have my own son, I feel so much for the poor mothers," gasps Kay. "The love you give these little souls and then for that to happen, it really gets to me." If getting soldiers to come and watch contemporary dance has been a pleasant surprise, their reaction has been even more of a welcome to Kay, "There is one particular scene when the characters are on patrol and you can see the military members of the audience shift in their seats. "Many soldiers have come up afterwards and said that parts of the performance made the hairs on the back of their necks stand up, but the show also has very complex choreography that earns the dancers respect. "We have a responsibility to understand what it is we ask our soldiers to do, and how it affects them. We aim to make an impact with this tour and make people see conflict and the repercussions of war in a new way." The show is supported by Arts Council England and the Army Benevolent Fund, The Soldiers' Charity, and will feature a series of events and post-show talks around performances. Running Time - 60 minutes. Tickets cost from £20 from the 5 Soldiers website. 23-25 April - BIRMINGHAM, Repertory Theatre, Broad Street, B1 2EP. Tickets from www.birmingham-rep.co.uk or call 0121 236 4455. 2-3 May - OXFORD, Wolfson College in partnership with Defence Studies Department, King's College London at the UK Defence Academy and Swindon Dance. Tickets from www.5soldiers.co.uk or call 0333 577 5700. Visual artist - David Cotterell.